This beautifully crafted acrylic display case has wood trim available in four different finish colors: black, cherry, walnut and oak. The case has five acrylic sides for perfect viewing and features a framed lockable door for easy access. 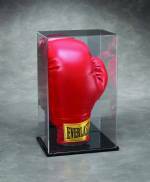 A matching wood stand is included so that the boxing glove you'd like to preserve and display can be propped up at the perfect angle. Acrylic provides 98% UV protection too! Back of case is lined with black felt. Case measures 10"H X 16"W X 10.25"D on the exterior and has 9.25"H X 15.25"W X 9.25"D dimensions on the interior. Wall mounting hardware is included, but not installed on the case.